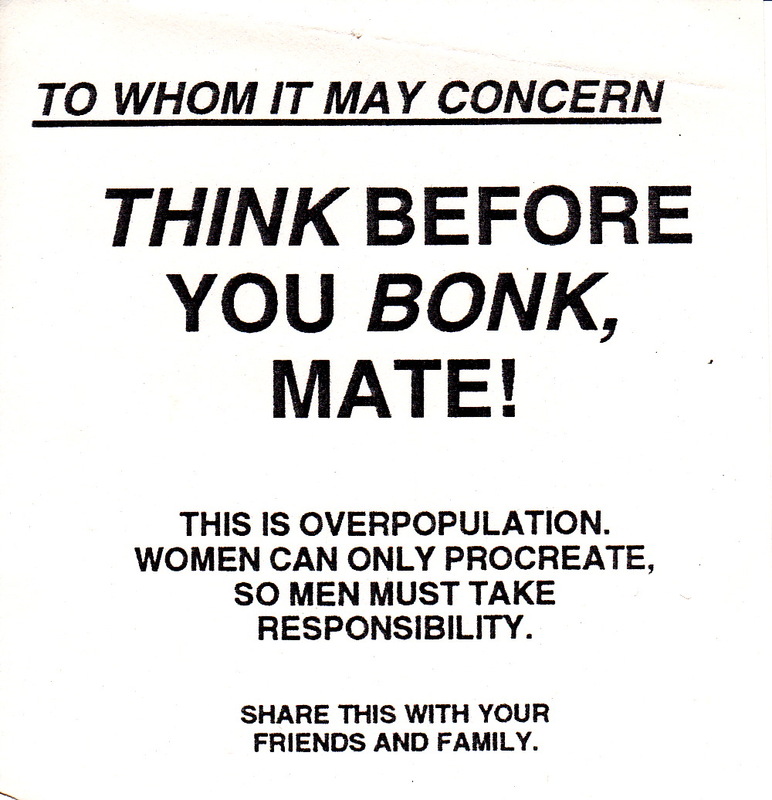 Mentioning overpopulation often seemed to be so explosive that it was felt safer to draw attention to it anonymously. This fear must be why, as Bindi Irwin found, it is nearly impossible to publish anything about it in newspapers and magazines, although it does seem to be slowly gaining popularity as an intelligent discussion topic. 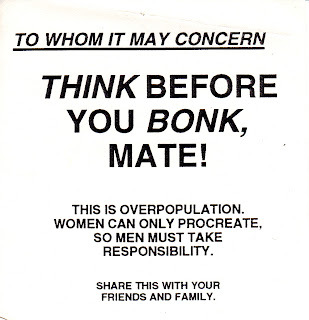 One effort we devised way back in the 90's to get around both these problems was the miniature flyer as shown above. It could be left anywhere—even dropped (accidentally, of course) in the street. In order to prevent the piece of paper being blown away, a penny was glued onto the back of each one. We were much entertained to see what happened to one such flyer, which was dropped into an empty shopping trolley on the roof of a high-rise car-park. A little boy, about 3, spotted the note in the trolley while his mother was busy unloading her shopping. He laboriously climbed into the trolley, retrieved the flyer, detached the penny, then checked to see no one was looking before carefully dropping the flyer over the wall to the street below. Then he ran up to his mummy, saying, "Look! I found a penny!" Doesn't that prove that acknowledgement of overpopulation need not be a totally humourless matter?